All items are thoughtfully and deliciously prepared Vegan and Gluten Free. You don’t even have to ask! But if you have additional allergies or aversions please let us know! 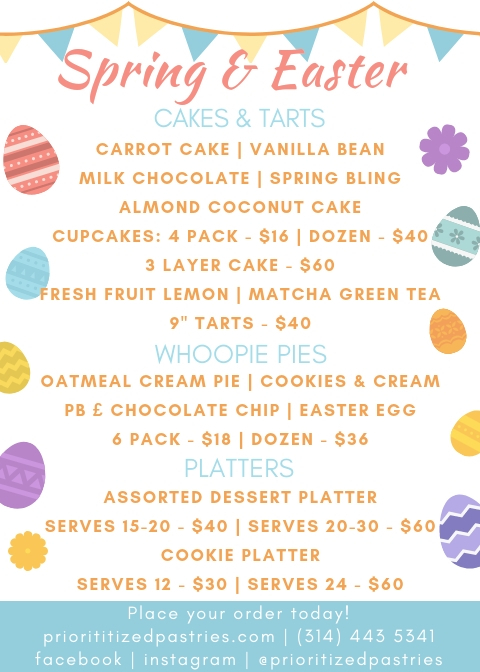 Orders for Pick-Up will be available at the Tower Grove Farmers Market on Saturday 4/20 from 8am-12:30pm. Please call or email if additional times or days are needed. Delivery is available on a first come, first serve basis for an additional $10 to anywhere in the Greater St. Louis area. All orders must be confirmed via email or by phone. Please feel free to email or call with any additional questions, comments or restrictions. Please list all allergies and restrictions.